I've been watching this product since the development and pre-order on TST's site. For me, it was most definitely worth the wait. I was a bit concerned that the smoke lens would interfere with the ability to see the red and orange LEDs clearly. This is not the case, as these two colors are super bright and very distinguishable while using your turn signal and brake light at the same time. As mentioned in another review, if you are keeping the license plate on the factory fender, buy the undertail closeout . It just looks much better with it on as well. Installation is very straight forward, especial after watching the TST YouTube video. Not the first product I've bought from TST and certainly won't be the last. Much different appearance from stock. Amazing tail light. Very bright! I bought the smoked lens and the look is crazy on my fz-09. 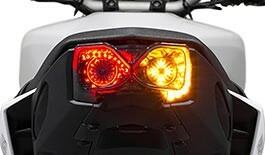 The strobe braking options is a very nice addition and gives a litle bit more visibility. Love the fact there is no more big ugly turn signals on the back of the bike!! Disadvantages: - Doesn't come with the LED relay, so you need to buy it with the tail light if you don't want the turn signals to flash too fast.